Whatever fierceness I have in me comes from Love. I am loved fiercely, and I love fiercely in return. I've written ad nauseam about my PTSD, anger, fears and worries as regards Mark's last major health crisis (or his health in general). Those are the things I'm not proud of, that I struggle with and have to work through. But there was something else. Something I had forgotten about, or failed to see or was overshadowed by the fear, until an email popped into my inbox. It asked if there was a time when I was fierce. And I realized that, yeah, there absolutely was. The most fierce I've ever had to be was when doctors told me I should prepare for the possibility that my husband was dying. I was fierce when I had to face my children and answer their questions about their dad. I was fierce while juggling family members. I was fierce when pushing for information from hospital staff. I was fierce when I absolutely had to focus on my own needs. I had to muster up fierceness when I was forced to tell my husband the doctors thought he might be dying. Mark and I were both fierce when signing living will/power of attorney papers. I was fierce by insisting my husband should go home. I was fierce when letting the tears flow. FACING MY WORST FEAR made me fierce! In the moments, I just did these things. At the time, I could not see the fierceness in my actions. Even though I nearly burst into tears after every few sentences writing this, I see now how I was fierce. I see now that I still am. 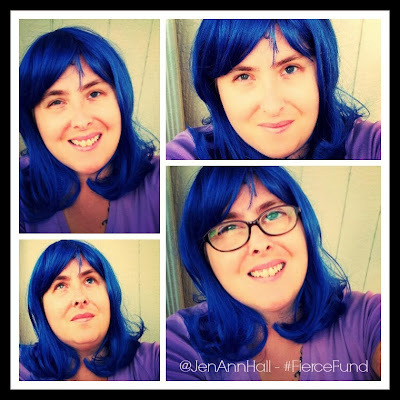 I am sharing this with you as part of The Traveling Blue Wig Project. It is to spread the word about the Clever Girls Collective's Fierce Fund, which is seeking to donate $20,000 in support of nonprofit initiatives that celebrate, encourage, and elevate women and girls. But they need YOUR help! There are three causes the Clever Girls want your help in choosing from: CoachArt, Dress for Success and Girls Who Code. You have until next Monday, October 21, 2013 to get your vote in. Do you have a story of a time you were Fierce? Tell me about it, and then go vote to support women and girls. Visit the #FierceFund to learn more about this girl-power project!